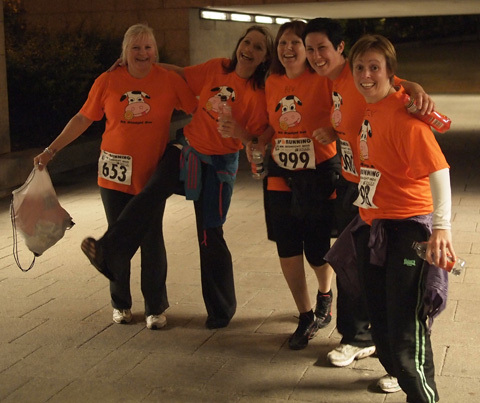 Last Saturday night was the 2012 Midnight Moo – an all ladies 10 mile walk through Milton Keynes. 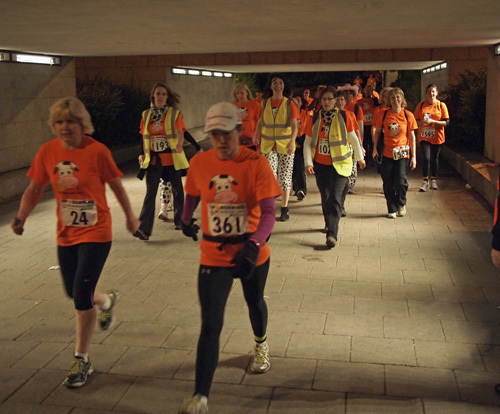 The herd set off a midnight and whilst they were busy striding through the early miles, Jammy Cow and her heifer friends were busy preparing the final mile for their welcome home. At the beginning of mile 10, ready to greet the herd for their final mile was the very professional Moos at Ten Cow, Mavis. She is a very sensible and reliable cow and in stark contrast to the next cow round the first corner. Silly Cow, Connie giggled her way through the night. 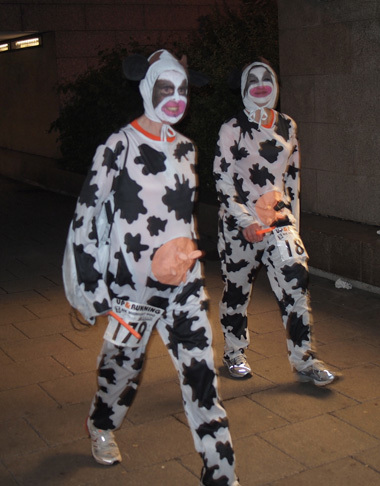 Those of you who walked the 10 miles will know that most of mile 10 is uphill so the Moos at Ten team were ready to add that extra bit of encouragement as the herd came through. Having said that, Bossy Cow’s version of encouragement is about as friendly as bootcamp with her strident, “Keep moooving!” shout. It is at this point in the early hours of the morning that you realise exactly how far 10 miles is to walk. “Holy cow, aren’t we there yet?” you may mutter as you pass the pious Holy Cow, Mary. Continuing up Midsummer Boulevard, the end is near and breakfast at Pret A Manger awaits, a thought not lost on the perpetually hungry Fat Cow, Victoria as she patiently waved the crowds through. Normally, Hetty the Mad Cow stands out as a bit odd but last night she was in good company with lots of ladies suitably dressed up for the night. Through Witan Gate underpass and by now there is less than half a mile to go. Bed is calling and lucky you, you’ll soon be home and tucked up. Lucy, the Lucky Cow was there, cheering you on for the final push. And only another 50 calories left to burn, something Clover, the Skinny Cow was quick to point out. Nearly at the end of mile 10 now and so very close to achieving your aim. A point to feel proud and to reflect upon why you are doing this. Willen Hospice is a fantastic cause and everyone is impressed by your fundraising efforts. Remember those Concrete Cows you passed in mile 7, well one makes a final appearance here to salute your efforts on behalf of Milton Keynes. 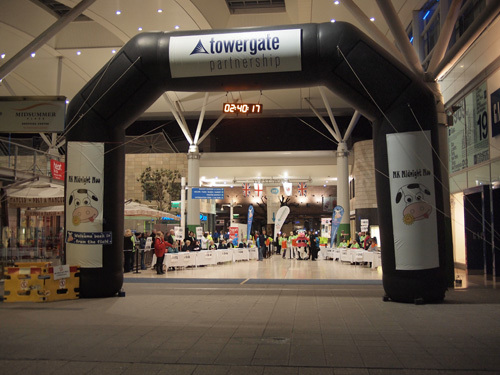 And there, with the end in sight, Jammy Cow welcomes you to the end of mile 10 and congratulates you on completing the Midnight Moo. A big cheer, breakfast, bath and bed. I have to say that I have never been a fan of Gina Ford. Although I haven’t read her book “The contented little baby” from cover to cover, I’ve read enough to know that I completely disagree with her ideas of strict routines, indeed I wonder how any mother could cope with doing anything else if she followed Ms Ford’s advice as every moment of the day and night appears to be mapped out! I was very interested in a parenting programme that was on TV a year or so ago which followed three couples who followed various styles of parenting; there was a couple who adopted a very strict time scheduled routine, a middle way and those who adopted an attachment style of parenting. I was not surprised to learn that the couple who practised attachment parenting were the ones who got the most sleep! Whilst I appreciate that this may not be for everybody, I think it is important for parents to know that they should listen to their instincts and parent in the way that makes them feel most comfortable and that they don’t have to listen to the “so-called” experts. Back to Gina Ford, in her new book “The contented mother’s guide” she apparently is advising women that they should resume marital relations within four to six weeks after the birth. Well, as a mother and a midwife I KNOW this will not be for everyone and indeed in some circumstances this could be positively dangerous and harmful. As a midwife, women have sometimes shared their stories with me and I have known women who resume sexual relations within days of childbirth and I also know that there are women who wait a year (or more). What is right for women couple will not be for another and you should follow your own instinct and not listen to a woman who has not had children herself!